Be the first to share your favorite memory, photo or story of STANTON . This memorial page is dedicated for family, friends and future generations to celebrate the life of their loved one. STANTON F. “STAN” LAVELLE, age 82; Loving husband of the late Mary Jo (nee McLaughlin); devoted father of Michael (Andrea), Kevin (Molly), Patrick (Megan) and Marty (Tara); dear grandpa of Olivia, Grace, Sean, Jack, Brian, Mary, Christopher, Joseph, Daniel, Diedre and Rory; great friend of many and avid golfer. 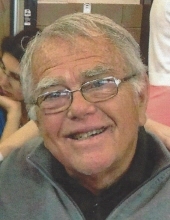 Stan was a 1955 Graduate of St. Ignatius High School and a 1959 Graduate of the University of Dayton. Passed away Sunday, March 24, 2019. Funeral Mass Our Lady of Angels Church, 3644 Rocky River Dr. Cleveland, Thursday, March 28th at 11:30 a.m. (EVERYONE PLEASE MEET AT CHURCH). Private Interment Holy Cross Cemetery. In lieu of flowers, memorials suggested to St. Ignatius High School, 1911 W 30th St, Cleveland, OH 44113. "Email Address" would like to share the life celebration of STANTON F. "STAN" LAVELLE. Click on the "link" to go to share a favorite memory or leave a condolence message for the family.